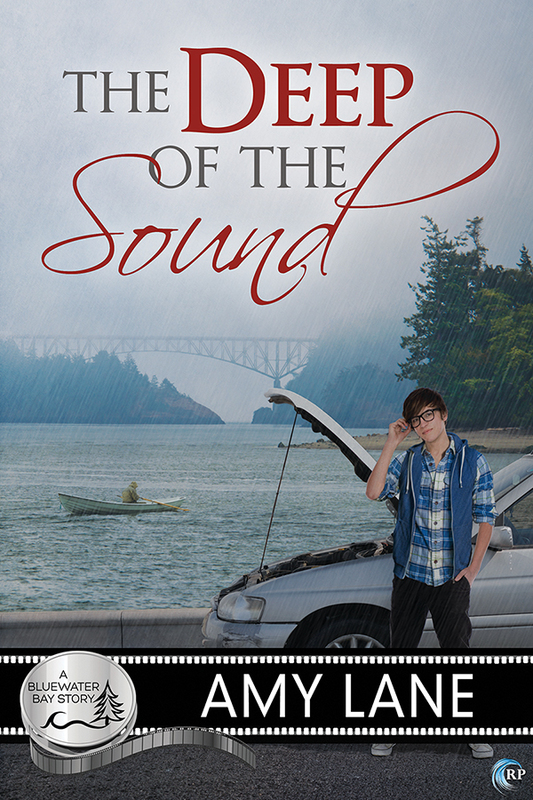 The Deep of Sound (Bluewater Bay, #8) by Amy Lane (Published by Riptide Publishing, June 15, 2015, 309 pages) A copy was provided in exchange for an honest review. Any parent with kids knows that feeling. That perfect blessed feeling when someone not him or herself suddenly takes over in the childrearing. It can be a grandparent coming over to let mom get a nap, or a favorite Aunt or Uncle taking the kids out roller skating in order to buy their affections—it doesn’t matter. Suddenly, for a moment, the caregiver gets to set down a psychic weight, a burden that is usually sweet but oh, God, it can really drag us down. That feeling of relief, of joy, is usually something we’re so grateful for, we’ll do anything. In this scene, Cal unexpectedly sets his burdens down and Avery picks them up. Cal is so grateful, that once, just this once, he may be tempted to let another human being– one who isn’t his great uncle and isn’t his brother—into his aching, guarded heart. Nobody was on 101 this late afternoon. If this person needed help, Cal had sort of a moral obligation. Bluewater Bay was forty miles away—if cell service was out, and it often was, this person was stranded but for the kindness of strangers. Cal left the truck running as he grabbed his slicker from the back and threw it on. And even though it had only happened once, when Keir was six years old, he continued with the regular litany of warnings. He rubbed his forehead, and Cal nodded. Everything with Keir was absolutely literal, including the need to state the memory that had become family legend. Cal’s father had shouted, “Keir, damn it, get in here!” from the garage, and six-year-old Keir had gotten behind the wheel and tried to drive the car into the house. Cal nodded and slammed the door, trotting around the truck to the little white Honda. He knocked on the steamed window, and backed away, giving whoever was inside some room. The door swung open and a scarecrow got out. He stood taller than Cal by at least two inches, with a riot of curly dark hair quickly plastering to his narrow face. He squinted at Cal through thick-framed glasses, which were held up by ears that stuck out a little. His plain blue hooded sweatshirt was growing quickly sodden in the rain, and he took off his glasses and grimaced at Cal in apology. Cal watched the young man think fast, then reach into the car and rummage. He came out with a backpack, the kind with the softened pocket that held a laptop. It was bulging out the front—probably with clothes and toiletries—and he killed the hazard lights and slammed the door. Avery nodded, not seeming to be put off at all. The truck steamed up the minute they got in, and Cal had to let the engine idle a minute so the defog would compensate for the extra body. Next to him, Keir and Avery were staring at each other. “I’m Avery.” The cab was pretty crowded, so Avery’s attempt to stick out his hand to shake was ridiculous, really. Cal darted a glance at Avery, to see if he’d be alienated by the abrupt speech pattern. Odd or truncated speech patterns often defined the severe Asperger’s part of Keir’s diagnosis, and introducing Keir to new people was always a challenge. Cal put the truck in gear, and risked a sideways look at Avery. He was peering at Keir speculatively but not unkindly. Cal swallowed. Wow. If you wanted to know what Keir thought of you, apparently just sit next to him and look at him funny. Avery sounded bitter, like the wound was fresh, and Cal grunted. Wow, could he have found anything more helpless in the rain? “Keir, maybe not tell all my business?” Cal said gruffly. There was a moment of silence, for which Cal could only be grateful. God, Keir could talk a subject to death. Avery responded easily, because apparently he really was as much of a nerd as he looked, and Cal fought the temptation to weep tears of gratitude. Keir’s focus was so very narrow. Natural history, that damned show, and Cal. Cal hated talking about his own life, could only quiz him so much on natural history, and only knew the very basics about the show. God, finally, someone who spoke Keir. For a good half an hour, Cal got to listen to them talk about everything from voice actors to animation houses to world building, and for that half an hour, Cal was both stunned and happy. His brother was really freakin’ smart. He analyzed this show with all the passion and intelligence of a literature major analyzing the works of Milton or Shakespeare. Cal remembered his old AP classes—Keir talked about dialog, conflict, theme—and Cal wanted to cry. All of those beautiful tools in his brain, all of that incredibly specialized function. But hearing another adult responding, understanding everything Keir was saying—that was a beautiful thing. Cal had seen the California license plates, and for a moment he was tempted to break into this freaking perfect storm of conversation, this gift of heaven for his brother, and demand to know if the A+ in geek was a California thing or an Avery Kennedy thing. Every comment on this blog tour enters you in a drawing for an eBook package of all of Amy Lane’s backlist titles with Riptide! (Excludes The Deep of the Sound and anthologies.) Entries close at midnight, Eastern time, on June 20, 2015. Contest is NOT restricted to U.S. entries. Thanks for the post and great tour! That’s an impressive prize! What a wonderful excerpt, off to buy…. I’m enjoying the blog tour. I love Amy’s books and know this one will be just as awesome. Looking forward to it. I am enjoying this fun tour! Great excerpt, thank you!